APMI was founded in 1999 by Greg Bickel in Mesa, Arizona with one idea in mind; total customer satisfaction. Their dedication to this philosophy along with pride, continuous improvement, teamwork and innovation has been the driving force behind the company’s success. In 2006, APMI relocated to Gilbert, AZ with growth in mind. APMI started as a one man operation and has grown into a 30,000 sq. ft. fully equipped facility, including an extensive weld shop that specializes in all welding disciplines. The many process capabilities of APMI enable them in producing precision sheet-metal, mechanical assemblies and frame weldments. The company can handle prototype, short run and production quantities to meet all customer demands in industries such as Aerospace, Semi-conductor, Medical, Military and Commercial. APMI’s engineering department can work from customer’s drawings or create drawings from ideas and samples. These capabilities allow APMI to achieve a customer oriented environment where clients can directly input their ideas for complete satisfaction. 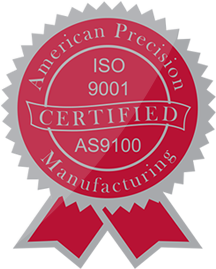 APMI provides much of our precision sheet metal work. They build parts for all kinds of our military applications, enclosures for one of our major OEMs and they even cut parts out of .500 plate, which is almost unheard of in precision sheet metal. Their service, their commitment to precision sheet metal, and the fact that they bend over backwards to accommodate last minute customer modifications, are some of the reasons why we continue to use APMI. I would very highly recommend them to anyone who needs precision sheet metal work done."